Mumm’s Sprouting Seeds Ltd. (the importer in Parkside, Saskatchewan, Canada) is warning the public not to consume the Mumm’s brand Sprouting Seeds described below because the product may be contaminated with Salmonella bacteria. Please click here for info on the pathogen Salmonella – bacteria. OTTAWA, March 30, 2012 – The Canadian Food Inspection Agency (CFIA) and Mumm’s Sprouting Seeds Ltd. are warning the public not to consume the Mumm’s brand Sprouting Seeds described below because the product may be contaminated with Salmonella. The affected product, Mumm’s brand Sprouting Seeds – Sunflower, are sold in 75 g packages bearing UPC 7 73295 07582 3 and lot # SF2020. This product is known to have been distributed in British Columbia, Alberta, Saskatchewan and Ontario and may have been distributed nationally. 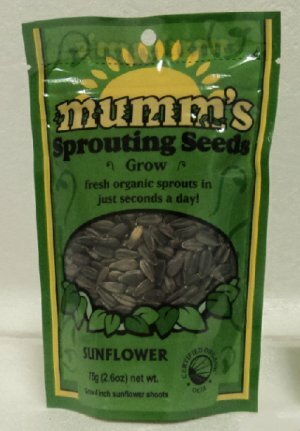 The importer, Mumm’s Sprouting Seeds Ltd., Parkside, SK, is voluntarily recalling the affected product from the marketplace. The CFIA is monitoring the effectiveness of the recall. OTTAWA, le 30 mars 2012 – L’Agence canadienne d’inspection des aliments (ACIA) et Mumm’s Sprouting Seeds Ltd. avisent la population de ne pas consommer le produit « Sprouting Seeds » de marque Mumm’s décrit ci dessous parce que celui-ci pourrait être contaminé par la bactérie Salmonella. Le produit visé, « Sprouting Seeds – Sunflower » de marque Mumm’s, se vend en emballages de 75 g portant le CUP 7 73295 07582 3 et le numéro de lot SF2020. Ce produit a été distribué en Colombie-Britannique, en Alberta, en Saskatchewan, en Ontario, mais il pourrait aussi l’avoir été à l’échelle nationale. L’importateur, Mumm’s Sprouting Seeds Ltd., situé à Parkside (Saskatchewan), retire volontairement du marché le produit visé. L’ACIA surveille l’efficacité du rappel. Author editorPosted on March 31, 2012 Categories Community, Health & WellnessTags canadian food inspection agency (cfia), may be contaminated with salmonella, mumm's sprouting seeds - sunflower, mumm's sprouting seeds ltd.